Elizabeth Moisan - Website of risingtidewriters! The best adventures start with imagination. Welcome to my page. Please browse to your heart's content. Feel free to use the links below to visit my web sites, and contact me using the form at the bottom of my page. You may also sign the guest book and leave a comment. I've been an artist all my life---a third generation professional and a legacy graduate of Parsons School of Design in NYC (1970), with a major in graphics and illustration. During my forty-plus-year career, I've been on staff as a carpet deigner for Stark Carpet Corp., in NYC, and Asmara, Inc., in Boston; freelanced; had one-man shows and been in group shows (watercolors); designed and painted theater sets; did magazine (editorial) and kid's book illustration; designed book covers; and took on calligraphy, watercolor, and portrait commissions. 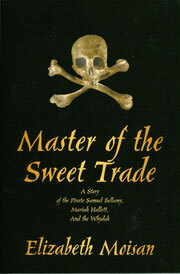 MASTER OF THE SWEET TRADE, my historical novel, was published in September 2009. It took seven years to write (it was a "hole and corner" operation because I worked full time) and then, too, the manuscript went through several incarnations while I decided what it was going to be when it finally "grew up." During this process I discovered the purpose of writing wasn't at all limited to imagining another world and being other people. It had somehow expanded to include the sheer joy of using the right words to build sentences, paragraphs, pages, and chapters. I'm a native New Yorker and genuine Cape Cod wash-a-shore; the founding host of two literary groups: ABITH (A Book in the Hand) and Shelf Space; I play folk guitar in an 7-member folk music group called Just Plain Folk and we perform locally; I knit; I lead a weekly writer's group; belong to a fun book club; and I'm an Arts and Letters member of the Cape Cod Branch of the National League of American Pen Women for which I am serving as vice president. I've been a widow for twenty-three years; I have a great 32-year-old son, Andrew, who's a para-medic and a talented writer and musician. And I live with a friendly, polite, perfect-New England-type-ginger-tabby cat named "Sam", after the pirate in my book. My illustration web site. Click on Art Gallery to see my work. For books that are, books in the works, and books that will be. 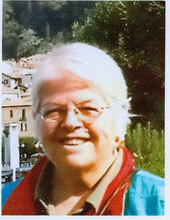 The web site for ABITH -- A Book in the Hand -- the monthly literary program I founded. I worked on staff for Asmara since 1993 as their only designer. To see my work, please visit the company web site. It's not Sam Bellamy's story alone that survives the years, but Mariah Hallett's as well. The are joined forever in rich Cape Cod legend and in tales of the sea. Tradition says it's his love for her that first leads him on his quest for gold. Sam comes to the New World from Plymouth, England, to start a new life, and on Cape Cod, in Massachusetts, he meets Mariah. They are kindred spirits, each out of step with the society into which they were born, and each finding total acceptance in the other. Sam's simple quest to find enough lost Spanish treasure (in the waters between Florida and Cuba) to offer Mariah a secure future quickly becomes an insatiable lust for gold. For eighteen months he sails the Caribbean under the black flag, allowing this means to an end -- this sweet trade of piracy -- to claim him. In February, 1717, he seizes the Whydah, a slave trip returning to England with incredible riches in her hold. With more than enough plunder to line his pockets, he turns the Whydah north to Cape Cod and his greatest prize, Mariah. While Sam is away, Mariah's secret is discovered and she faces dark and sinister challenges when she is not only charged with murder, but faces accusations of witchcraft as well. Confronting a harsh winter and an uncertain future, she struggles to survive alone on the rough Cape Cod moor that edges the sea. With unshakable faith that Sam will return to her, she walks the cliffs of Lucifer Land overlooking the wild Atlantic and watches for his ship. As the Whydah makes her way north along the east coast of the American Colonies, Sam and his crew plunder vessels engaged in honest trade, adding ships to their fleet and treasure to their coffers. As they pass between Nantucket Island and Georges Bank, they are becalmed for long stressful hours in a dense fog off Cape Cod's "elbow." When the fog lifts, instead of heading into deeper waters to follow a course to Maine and a rendezvous with a captain in his fleet, Sam navigates close to the Cape's rough Atlantic shore in preparation to sail around the "hook", into Cape Cod Bay--and to his Mariah. Caught in a sudden, violent storm (now thought to have been an Occluded Front) on the night of April 26, 1717, three of the four pirate ships run aground leaving the Whydah and her crew to fight for survival on their own. Alone in her cabin when the storm breaks, Mariah dashes out into the night, and struggling to stand on the cliffs, watches as a ship crashes on the shoals off shore. She knows in her heart this ship is Sam's. THE CRAWLING MIST THREADED ITS GHOST-LIKE FINGERS THROUGH the Whydah’s rigging, pulling her in hand over hand until it reached her stern and swallowed her whole. Water lapped against her hull in small rhythmic splashes as she fl oated nearly motionless on the calm sea. She groaned and creaked, adding her own dark whispers and shadowy noises to the watery concerto. voice cutting through the menacing silence like a double-edged sword. Announcing their presence in the fog kept the Whydah safe from colliding with another ship, but also left them vulnerable to discovery. The edgy crew, willing to fi ght to the death to save themselves and their rich cargo, kept a silent watch. Bound together in this enterprise by an oath, each man was alone in his vigil and in his thoughts. It was all in Sam Bellamy’s hands, and never had he felt as exposed as he did here, deep inside this dense, soul-draining fog. His crew was loyal, and in exchange for that fidelity, he’d given them his best. They followed his orders knowing his plans to be square and true. Every day for a year and a half they risked capture and the hellish blackness of the gallows and gibbet, to be with him at the end of their journey. And now, so close to Maine and the safe haven on Green Island that they might be there within a few days, Sam charted a new course to Cape Cod, their rendezvous with the Marianne postponed so he could follow his heart to Mariah. Nantucket for close to twelve hours, and with each passing minute their chances of remaining unseen and unchallenged decreased. Everything was at stake: their prize ship, their golden plunder stored in the dark belly of the Whydah, their dreams of ease and abundance—and their lives. Their luck couldn’t hold out much longer. them, violating their small patch of visible ocean. They were no longer alone. He stared at what Jean had already seen and stood frozen in place as each terrifying second ticked slowly by. The rudderless ship had broached and was taking an oncoming swell broadside. The wall of black water rose high on her starboard side, invisible in the night; they could not see its crest. Its height caused the wind to drop, and in the unnatural quiet Sam could hear the hissing of the water as it collected, building strength and size. The cold, briny smell was overwhelming. The Whydah rode the enormous swell higher and higher, until it broke and crashed, violently drowning her; rolling her to larboard, her bare masts and spars dipping beneath the massive explosion of water. The ocean swirled all around and was swallowed by the opened hatches. Sam, gripping something—he didn’t know what—held on for his life as he was plunged into the churning sea. thud. The Whydah had miraculously righted herself, pulling him to the surface, and he lay there, stunned and disoriented. His lungs ached; his eyes burned from the salt. He’d swallowed seawater, and his stomach heaved. Struggling to his hands and knees, he vomited on the deck, tasting the hot acid and sweetness of the Madeira. Amid the earsplitting roar of the storm, he heard the bell ringing. He and the Whydah were still alive. She picked up her basket, but as she walked to the tavern, her legs and back ached with every step. Her belly felt heavier and heavier, and a dull pain started as the baby began to press down hard at the base of her spine. “I can’t—do this,” she gasped, her breath coming hard. “I have to—Oh, my God!” A tightening surge of pain shot through her as the pressure increased, and rivulets of sweat ran down her face, stinging her eyes. She stood in the sand and looked ahead to the tavern door, but the short distance seemed impossible to cross without help. The spasm passed and she took a few cautious steps. When she could breathe easily, she walked slowly home. She was nearly there when pain gripped her again, suddenly, horribly. It doubled her over, squeezing, crushing, sharp, and hot. Shrieking, she gripped her belly and dropped into a squat, her knees far apart. Susannah came running. “Oh, my God! Will! Will! Come quick! and brought him down to the taproom. “Come an’ see,” she said softly to the men who had been waiting. Thankful followed a well-worn path toward the edge of the cliff where Mariah had watched the storm, and from there she saw the wreck lying on the shoals. The relentless sea still pounded and tore at the wooden corpse, pulling it, bit by bit, beneath the waves. Tangled spars, sails, and rope washed up in the heavy, breaking surf, and wreckage littered the beach in both directions. Human wreckage, twisted and grotesque, wove through the scene like a blood-red thread in a sandcolored fabric. below, unable to close her eyes. anything that might have use or value. Some went through the clothing of the dead sailors, and others hacked off the fi ngers and ears of the dead men to get at their rings and earrings. One woman, a neighbor who sat in the next pew at church and had been to quilting bees with Thankful’s mother, braced her foot on the chest of a dead man and yanked hard at his necklaces. The beads scattered, and the woman dropped to her knees, frantically scrambling to collect them all. From her vantage point high above the disaster, Thankful watched the tragedy unfolding in dark fascination, until she saw her father walking among the bodies. She dropped quickly to the ground and, lying on her stomach, peered over the edge of the cliff. He walked through the wreckage, and stopping at each corpse, noted something in a little book. Justice Doane was with him, as were some of the men who’d come to the house earlier that morning, and they directed each body to be laid out on a section of beach they’d cleared for that purpose. No one paid attention to the violation of the dead. Her eyes were riveted on her father as he performed his grim task, and when he paused to absently scan the beach, she ducked out of sight. But where was Mariah? Had Sam been aboard this wreck? Was she looking for him? Thankful lay on the damp sand overwhelmed by theterrible activity on the beach, and wondered what to do. Uncomfortable and chilly, she pulled her cloak tightly about her and noticed how much of the cliff had been eaten away by the sea during the storm. She wriggled closer to the edge and looked down. Beneath her, the sand, mixed with grass and shrubs from above and seaweed and wreckage from below, was smoothed out by the receding tide, which made littlerivulets on its way back to sea. She saw a bit of fabric—another body: a dead sailor’s coat. But the bright, multi-colored cloth held her eye. “It’s her shawl!” She scrambled to her feet, and slipping and sliding along the path down to the beach, sprinted across the sand. and debris, and frantically digging in the sand, Thankful pulled it free. She pushed and tugged at bits of wreckage, searching wildly about for signs of her friend. looked across the wide beach. I can do this, she thought desperately. searching for Sam. If I want to fi nd her, I’ll have to look for him, too. Clutching Mariah’s shawl, she walked into the nightmarish scene. What she had once witnessed from a safe distance was now at arm’s length. Bodies, gray and pale, sprawled about her: crumpled and mangled; wet from the sea; wet from the rain; draped in seaweed; wrapped in ship’s line; half buried in sand; caught beneath wreckage. Dead eyes watched her. Open mouths twisted into hideous, toothless grins, smiled at her. Broken limbs, bent at wild angles, beckoned to her. Smashed skulls, headless bodies, and torn limbs vied for her attention. Ears and fingers lay scattered in the sand like carrion picked clean and tossed aside by human scavengers. her stomach. Nausea crept into her throat and she vomited. Staggering to the wet sand, she scooped up some water and rinsed her face. A corpse washed up at her feet, its arms and legs waving a death’s greeting to her in the churning surf. She closed her eyes, and swallowed, then turned to walk up the beach, forcing herself to go on. Big ones, small ones, skinny and fat ones, tall ones, short ones; thick paper, biblical paper; lots of words, few words; lots of pictures, no pictures; illustrations; coffee-table books, books for the loo, books for the beach; fiction, non-fiction; poetry; anthologies of essays or short stories; naked truths, bald-faced lies, veiled hints, or in-your-face opinion; anonymous, ghost-written, plagiarized; over-edited, under-edited; so boring that the endless words go onandonandonandon; so engaging and gripping that the last few chapters have to be rationed; so-awful-you-don’t-care-who-the-murderer-is-and-you-hope-everybody-gets-creamed-by-the-end-of-the-first-chapter-which-you-are-not-going-to-finish-out-of-self-defence (or defiance); dust jackets, jacket flaps, hard covers, soft covers, board books; smooth paper, rough paper with deckled edges; serif letters, sans-serif letters; beginnings, middles, and ends; American spines going this way > ; English spines going that way < ; the patterns, designs, and color combinations of a row of books side-by-side on a shelf; teeny-tiny biblical type, large-print for early readers and the hard-of-seeing; mass market, trade paperbacks, perfect binding, Morocco-bound with gold-leaf letters, hand-bound, signatures, and stitching; gilt edges; arty, artless; research and reference; three-hanky-books for tears of light-hearted mirth or tears of the bleakest sorrow; the look, the feel, the heft (or lack-thereof), the smell, the dust; the gradual transition from brand-new to old friend; paper, ink, glue, staples, spines, covers, title pages; author autographs in ink and personal inscriptions also in ink; book plates and “ex libris;” libraries, book stores, book shelves, stacks, piles; rare, old, best sellers, classics, debut books; book marks, dog-eared pages, margin notes, underlining; the sheer joy and tactile pleasure of reading and owning a real book. No one can autograph an e-book, neither can you bequeath an electronic library to your heirs. In a few years advancing technology will leave your reading device behind, and your e-books will be unusable, not unlike 8mm movie projectors and slide carousel trays. There are some who won’t even pick up a real book without pronouncing, “The future is in e-books.” It isn’t. There are approximately 12 – 18 inches beneath the average Christmas tree just begging to be filled with books. Always shop early. And local. National “Buy-a-book Day” and “Give-a-book Day” are celebrated 365 days-a-year, including leap years. Never miss a chance to observe these holidays. Open a book and open a mind. Thank you very much for supporting your libraries, indie booksellers and publishers, and local authors. Please drop me a line! Thanks. Or leave your name and a comment below. Thanks. I just shared this upon Facebook! My buddies will really enjoy it! now, now. let's not get testy. Skippy, dear--- blow it out your ear. all these instructions are making me nuts. I just love your book I haven't read yet. Just waiting for that rocking chair on the veranda to appear. BTW, had good luck with font and size manipulation, and added a couple of things. zounds, woman---where are these messages going?